I Spy Animals: What's black and white and swims upside-down? What's black and white and swims upside-down? One of the world's smallest dolphins! 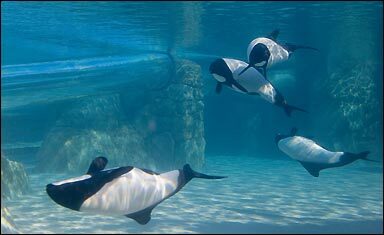 There are only about 25 in captivity, so I was lucky to see two at Sea World in San Diego. I watched them for about 45 minutes, and they both swam around their tank upside-down the whole time. There's no good reason, but this dolphin loves to spin and leap out of the water; they are very active...so maybe swimming upside-down is just fun! 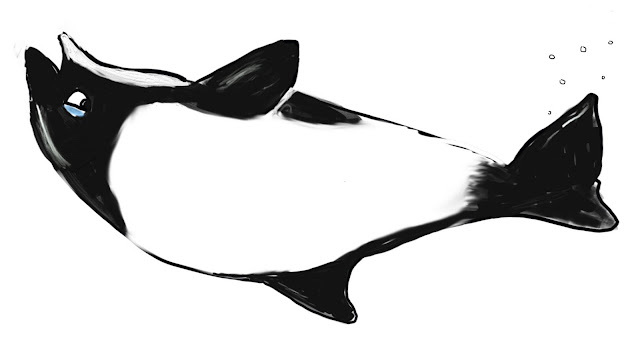 But really, you just need to remember this: if you see a dolphin swimming upside-down, and its coloring reminds you of a panda, you've probably spotted a Commerson's dolphin!